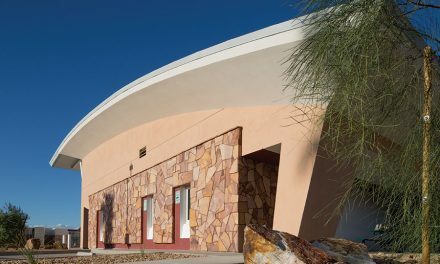 Until recently, additional insulation required fastening sheets of foam to the outside of the building, a labor-intensive process that also complicated the entire build. 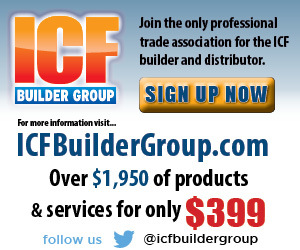 ICFs have a reputation for energy efficiency. 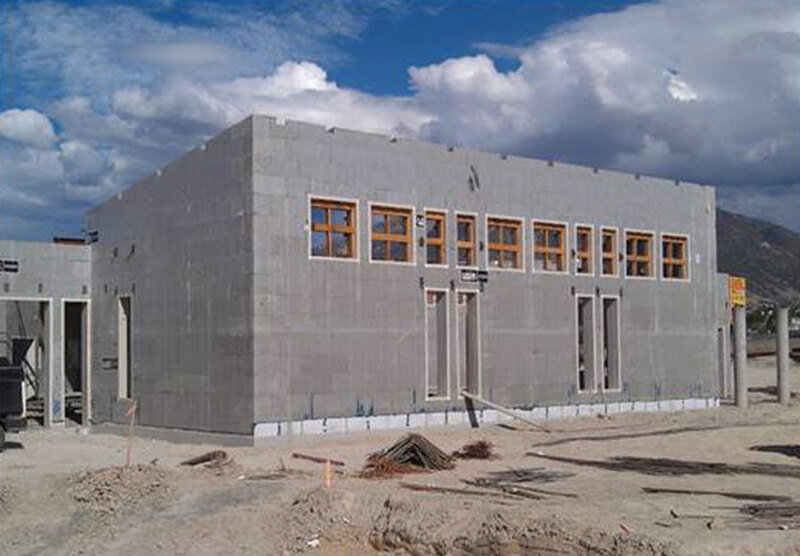 The combination of thermal mass, airtight construction, and two continuous layers of highly insulative EPS foam create walls that dramatically outperform standard wood-frame construction. Mike Kennaw, vice-president of sales at Fox Blocks reports that quite a few projects in the U.S. are already going net zero or code plus. Until recently, that meant mechanically fastening sheets of rigid foam to the exterior of the ICF. It requires a good deal of ingenuity to work around the construction hassles it created; Windows, doors, siding, exterior decks and other features become difficult to attach when the furring strips are hidden under 2 inches (or more) of foam. And on multi-story buildings, the labor component is significant. 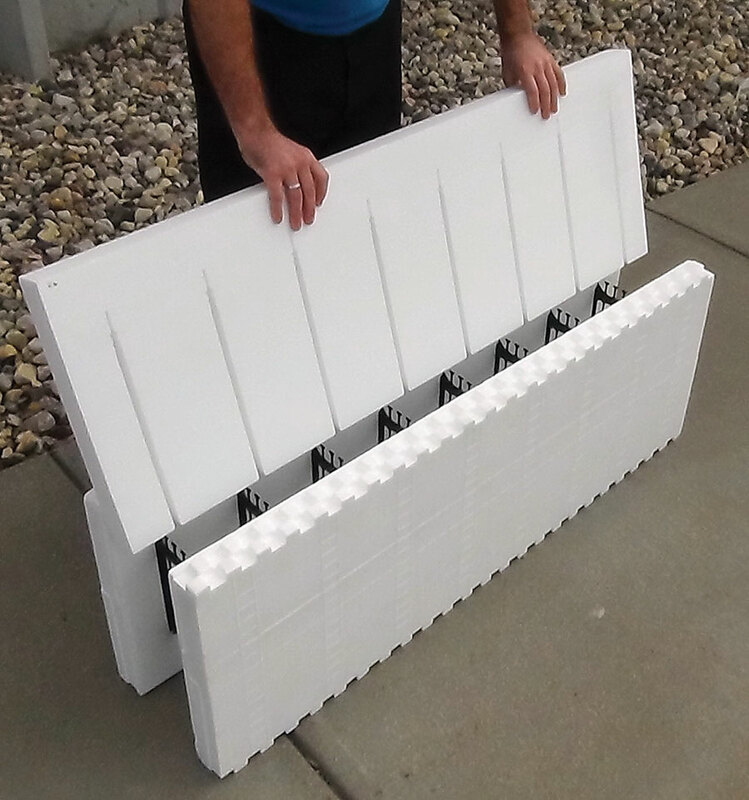 To meet demand while simplifying installation a number of ICF manufacturers have introduced products that offer “off-the-shelf” solutions for extreme R-Value projects. These solutions have varied from offering thicker side panels or foam inserts to switching to a graphite enhanced EPS bead, which offers slightly higher R-Values in the same wall thickness. Some companies pursued multiple alternatives. Logix ICF, for instance, offers a “Platinum-Series” graphite-infused block, an XRV knockdown panel with up to 8” sidewalls, and a D-Rv foam insert. In the 1990s, German chemical giant BASF developed a new type of EPS bead named Neopor. Coated with powdered graphite, Neopor has higher R-Values and reflects more heat than regular EPS, thanks to its dark gray color. It was introduced to the North American market in 2006. Graphite-enhanced foam boosts R-Values by about 15%. 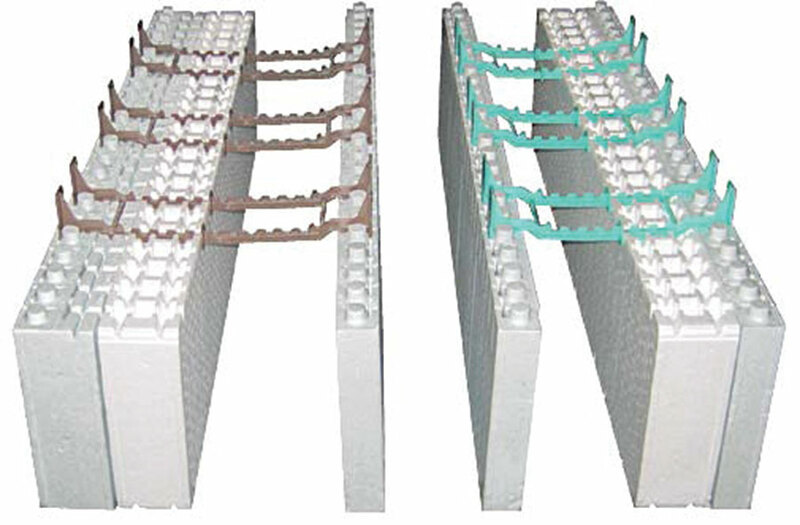 In 2009, Logix unveiled their “Platinum Series” ICF made with Neopor. In January 2011, Fox Blocks followed suit with their “Silver Fox” lineup. The graphite-enhanced foam delivers about 15% more insulation per inch compared to regular EPS. “The biggest advantage is that you go from R-25 to R-28 without increasing the wall thickness,” says Lennox. “And from a molder perspective, we can use the same molds and tooling.” The additional R-3 costs the builder an additional $0.40 sq. ft. and does not increase wall thickness or increase the distance between the furring strip and the exterior wall face. In order to push the R-Value of an ICF wall beyond 30, the total amount of foam in the ICF needs just under seven inches of foam. While that foam could be adhered to the outside of the ICF after the fact, better solutions exist. 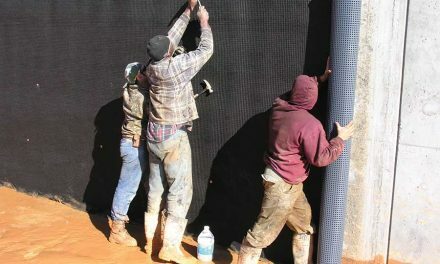 Using thicker sidewalls or foam inserts accomplishes the same purpose with much less labor. 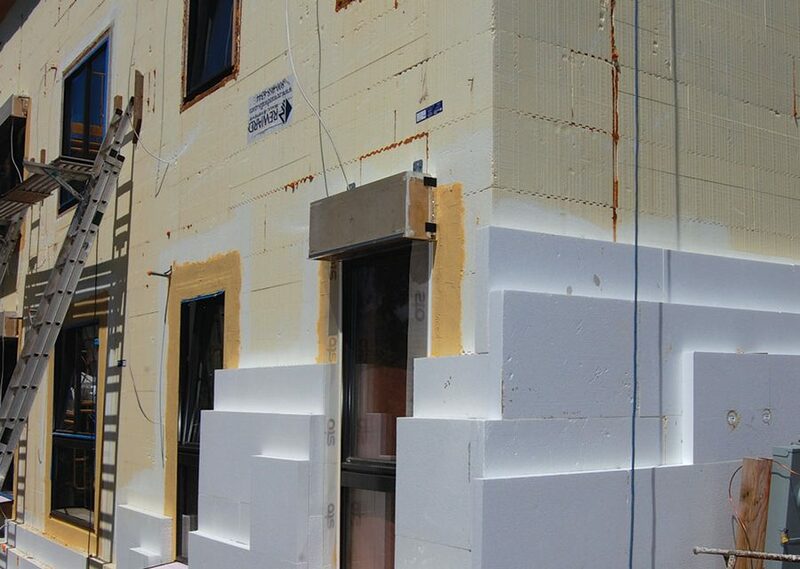 EPS insert panels, like this Boost-R by Reward, make it easy to increase insulation values with minimal labor. The techniques discussed in this article can often be combined. Here Logix’ D-Rv panel is used in conjunction with their graphite-enhanced Platinum Series. A handful of companies have developed foam inserts that fit inside the core, effectively boosting R-Value without having to design an entirely new product line-up. The Boost-R Panel by Reward and D-Rv panel by Logix ICF both measure 48”x16”, the same dimension as their ICF. Both panels have series of slots cut in them that allow it to slide between the webs and lock into place. They can be installed on either side of the core. “The Boost-R Panels are cost-effective solution, from both a material and installation standpoint, to achieve higher actual R-values,” says Hank Pfeiffer COO, Reward Wall Systems. Available in two-inch increments (R-8 for white foam; R-9 for graphite), they can be installed in multiples for even higher R-Values. For instance, two 2-inch Boost-R Panels would fit neatly inside a 10”-core Reward ICF (15” total width), creating an R-39 wall with a 6” concrete core. Logix’s Pro D-Rv will create R-Values from 25 to 33; with Platinum Series inserts, it rises to 28-37. Quad-Lock Building Systems also offers a four-inch thick insert that matches the dimension of their standard block (48x12). The “Extra Panel” allows the additional insulation to extend completely into corners. 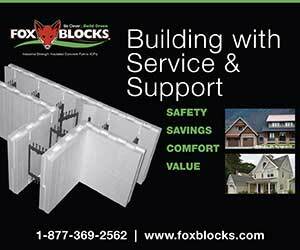 Fox Block uses an “Energy Stick” that is vertically oriented. The long pieces of foam (measuring 2” thick and 32” tall) are just less than 8” wide so that slides easily into place between the ties inside the wall cavity. A typical eight-foot wall would require three Energy Sticks (96”) in every space between ties. 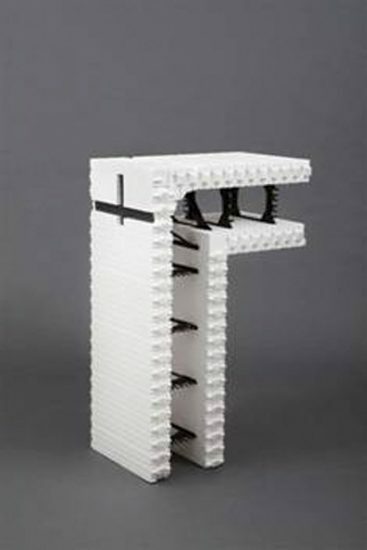 Kennaw says that the system reduces waste, and can fit into the 90 and 45 degree corner blocks, as well. Like the panels, Energy Sticks can be double- or triple-stacked for extreme R-Values. Three graphite Energy Stick layers inside a 12” cavity block would create R- 48+ with 6” of concrete. Reward and Fox Blocks executives say the inserts are intended strictly for insulation value. Lennox, at Logix, claims that off-setting the D-Rv panel (spanning the joints in the block) can make the wall even stronger and more forgiving on pour day. As mentioned earlier, at least four companies have met demand for higher R-Value by offering thicker sidewalls. Three of them are knockdown forms. 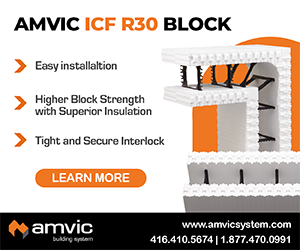 The other, Amvic, introduced an entirely new “third generation” ICF named Plus 3.30. 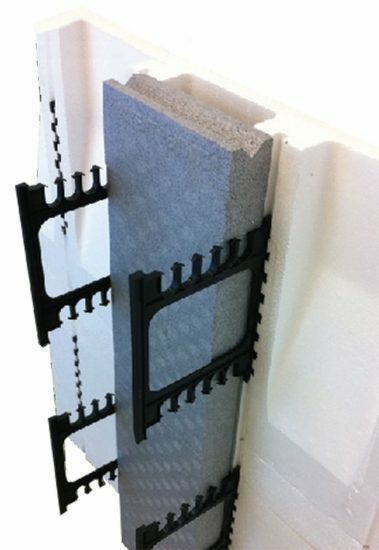 One of the first ICFs to offer an enhanced performance product is Quad-Lock, which introduced the PLUS panel with 4 ¼ inches of foam per side, in 2005. “It all goes back to our European roots,” explains Doug Bennion, technical manager for the company. “At the time, European codes were light years ahead of the U.S. and Canada, and our directors wanted all the product for the European market available in the U.S. The company has recently rolled out a 3 ⅛” thick panel dubbed QPX3 as well. Both the 3” and 4” panels can be used on interchangeably with the standard 2 ¼” panel and can be used in conjunction with the company’s foam inserts as well. The wide range of combinations offered in sidewall thicknesses and inserts allow designers to easily fine-tune insulation values at virtually any level. The Logix knockdown form is called the XRV (for “Xtreme R-Value) and can be mixed and matched with any other form in Logix’s KD (knockdown) lineup. That means taper-tops, brickledges, and other specialty forms can be incorporated easily. The thicker panels are available in one-inch increments from four to eight inches and can be added to either (or both) sides. Eight inches of Platinum foam on both sides of the wall yields a theoretical R-71! 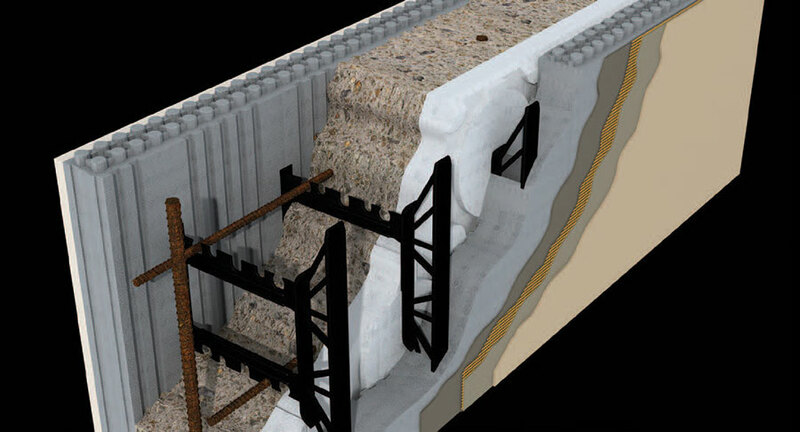 TF Forming Systems is a vertical ICF that offers a range of sidewall thicknesses. While the standard sidewall is 2 ½ inches, they can custom-cut sidewalls to virtually any dimension. TF uses a full-height tie that fits into a groove cut into the foam after the thickness is determined, so the furring strip stays near the exterior faces regardless of the foam thickness. And with ties for core sizes ranging from four inches to 36 inches, there are really no constraints. Amvic is the only manufacturer to design a new form with thicker sidewalls and factory-molded ties. “We wanted to provide an all-in-one solution that wouldn’t require any extra labor or cost on the part of the installer,” says Brown. “We designed a block that is significantly stronger than the previous one, easier to stack and install, and our previous block was very robust.” He claims the Amvic Plus 3.30 will deliver straighter walls, stronger corners, and better drainage in the interlock when compared to the typical block. Quad-Lock’s PLUS panels can be used interchangeably with regular forms and the foam inserts to create a wide range of R-Values. “We looked at everything, and at the end of the day, we selected what would be best for the installer, the overall performance of the system—and from a cost perspective—the biggest bang for the buck,” he continues. The company invested several hundred thousand dollars for the cost of the mold. The two EPS side panels have been thickened by 30% (going from 2.5” to 3.30” per side) for a total EPS width of 6.5”. The wider EPS foam increases the R-value of the block from R22 to near R30, giving it the highest R-value of any factory-assembled ICF block. The 90-degree corner is massive, each block providing 7.78 sq. ft. of wall area. The 45-degree corner block is an equally astonishing 6.22 sq. ft. Diagonal cross ties and additional furring strips put them among the strongest corner blocks in the industry. Regular ICFs are far above current code requirements, and most energy loss is through the roof and windows anyway. “I think they’re finding that money may be better spent on focusing on roof insulation, windows, connections, and penetrations. 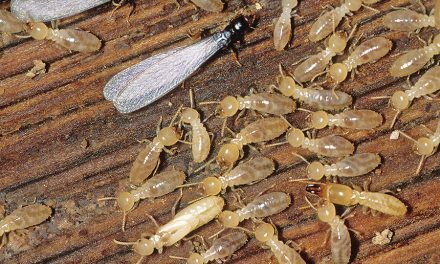 Air infiltration is a big deal, and eliminating that may be a better first step than adding foam,” he says.